Last Thursday (June 7th), Sally Pewhairangi, Sean Murgatroyd and I held our second Reality Librarianship event. 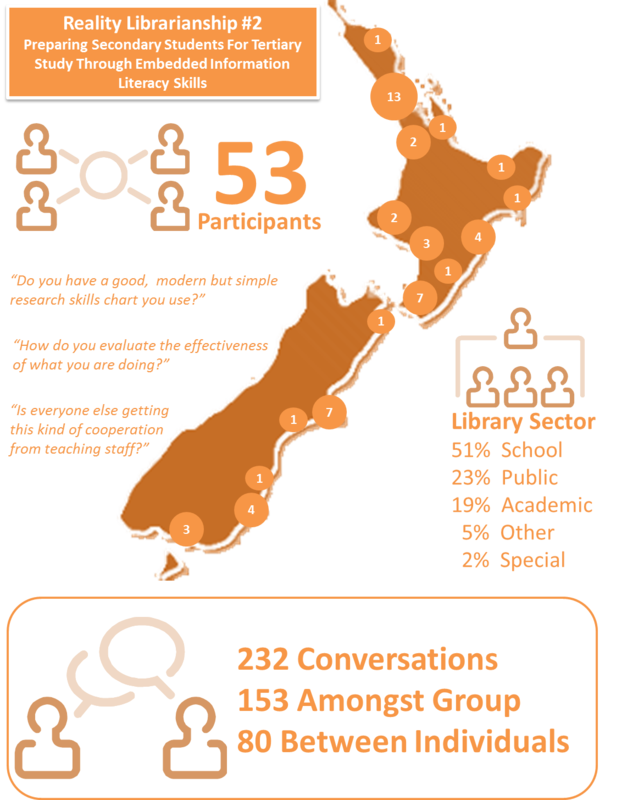 Librarians from all over New Zealand took time out to join us online for half an hour to hear Senga White share her experiences of “embedded literacy” at James Hargest College in Invercargill. Questions came in from the audience via chat (text/typing), and fed into the discussion between Senga & myself. It was a real buzz to see people engaged in the topic – asking questions, offering encouragement and sharing their ideas. Another important buzz for me was that it was a cross-sector discussion, there were people from high school, tertiary and public libraries. I’m really looking forward to this week’s session with Paul Hayton, and talking about his experiences at Powerhouse Museum in Sydney. Join us for the discussion.